How to export only checked record from gridview to excel? In this article I am going to explain about how to export only selected checkbox row record from gridview to excel in ASP.NET. This concept is may be used in your project various situation. Mostly we are display large number of records in the grid view. At that time we want only particular record details can export to excel using this resource technique you can export that selected row all details to excel. 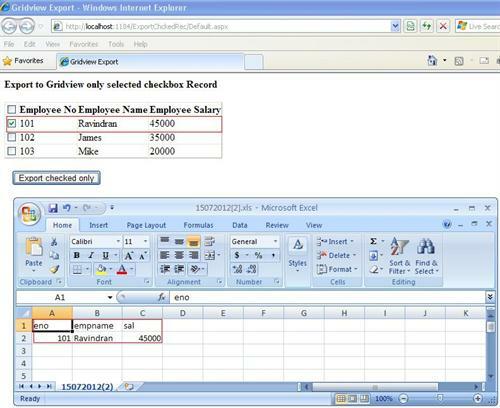 I have placed one gridview with checkbox column and provide one button export to excel. I hope this article is help you to know about export to excel only selected record.